It funny how linkdelete .com is charge $57per/m to $157 for a link removal service and the webmaster must remove his links for free who is scamming who. Great post Ann, links are hard to remove in some cases. It is legitimate sometimes and people can’t aware to put the link on good resource. Currently webmaster owner remove the bad links but the link removal ratio is not upto 100% and its very tough to identify unnatural links. This post quite helpful to those who want to clean up their link profile. If you want to know more about Ann Smarty and her thoughts then please visit her online interview in my blog in this url Online Interview With My Blog Guest CEO- Ann Smarty.Thanks for reading! Shocking that Bluehost would consider acting on that sort of message. My understanding is that big companies take that approach because they know it works more effectively than asking politely. They want results. I read a while back (cannot remember where) a discussion on an SEO forum about a similar thing – some company declared it illegal for anyone to link to them without at first asking permission. So this is not the fist time. As for the law – a link to a site cannot be against the law. You are not taking anything from them, you are actually giving them free traffic. “We link to you as we wish to share your site with our readers. It provides additional information that readers may be interested in. Would you be happy if we simply added rel=”nofollow” to the link so show Google that it is not intended for SEO purposes”. Something like that. Mind you, still pretty dumb. The Internet relies on links – the links are what make the web! Yep, Phil, that’s why I closed the account with them and moved to another hosting. I was recently asked to remove links to a large company. 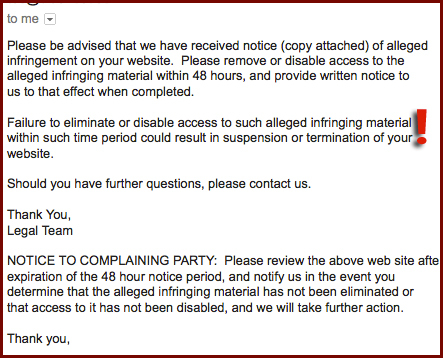 I ignored the email, and a few days later they emailed to say that the links could stay if they were no-follow. All links in post are no follow and I think it was a bog standard email sent to everyone. I don’t see where google is going with this, big organisations will have a lot of “unauthorised” links to their sites from multiple places, it’s natural and organic linking that helps the reader. Why would they want to stop that? I get a lot of companies approaching me to remove links in my comments section, they have paid people to leave comments and link to their website in the past. This has been around for a while as a link building tactic. Find a competitor who has T&C’s forbidding unauthorised inbound links, find out if any such links exist, and advise those sites to link to your client/site instead. I personally run a number of websites and have never received any requests as yet to have links removed from posts or comments – but then I have never approved any of those obvious spam comments which have been left purely for linking purposes. I follow the Groucho Marx philosophy in that respect, any site which will allow spam comments and links isn’t worth being linked from (he said “I refuse to join any club that would have me as a member”). If I were ever asked to remove links I would refuse absolutely, in much the same way I would refuse to add a dodgy link or allow a spam comment in the first place. The web is natural, links are natural. Any attempt to manipulate them by black hat SEO companies isn’t something I condone, and it isn’t something Google would want either. I chanced upon this article doing a Google search on “SEO companies asking me to remove my links to their clients’ websites” (or something similar). I must say, your experience has been far worse than mine. 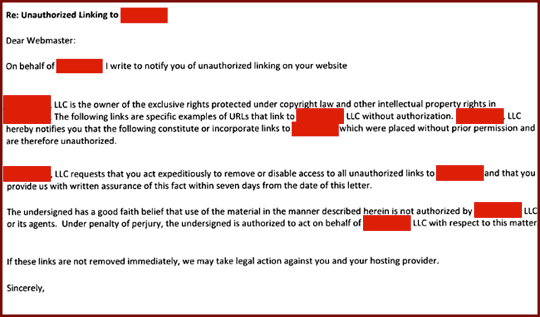 All I’ve been getting recently have been e-mails from pesky SEO companies telling me to remove links to their websites, but nothing of the kind of threatening legal tone that you mention in your post. But if you had insisted on your right, there would have been NOTHING they could have done to you. As you mentioned, what on earth is an “unauthorised link”?! And as one of the commenters above wrote, there are no laws regarding linking on the Internet. Your host might indeed have shut down your site though (and you may have needed to wage a costly legal battle to get back your money, ironically). Wow thats just uncalled for, but I do understand why a company would be concern about someone linking to them, but if its a quality website then its like c’mon really lo. Great post Ann as always. Many traditional businesses believe they own everything (and even everyone). My philosophy is if they don’t appreciate links and attribution they don’t deserve them anyway. People need to understand that anyone can sue you any time for anything – whether it is against any particular law or not. The legal system is primarily used by those with the most money to intimidate and bully those without the resources to fight. Whoever has the most money or is willing to waste the most time and resources on court costs wins. Winning means very little because then there are typically endless appeals – and winning is one thing while collecting quite another. 1) Do not intentionally poke snakes, i.e., limit interactions with any company that is likely to sue over anything or nothing. 2) When asked to remove links, images, videos, etc., do so immediately. 3) Comply with any (mostly reasonable) cease and desist demands unless you intend to get someone with really deep pockets to fight all the way to The Supreme Court if need be. The reason I primarily move in the CommentLuv community is that those who use it are far less likely to object to being linked to or recommended. this post is helpfull bt I have a point to say here links are hard to remove in some cases. It is legitimate sometimes and people can’t aware to put the link on good resource. Currently webmaster owner remove the bad links but the link removal ratio is not upto 100% and its very tough to identify unnatural links. I think some misunderstandings may happen. You can contact with BlueHost to solve it. I would have removed the link also. Wow. I have never heard of anything like this. So if you have a good legit healthy site then why would they want the link removed? It will only help them. Plus they could always just disavow in in Google webmaster tools. Thank you for sharing with us such a great information.There are some fundamental principles about links on which the Web is based. These are principles allow the world of distributed hypertext to work. Lawyers, users and technology and content providers must all agree to respect these principles. It is difficult to emphasize how important these issues are for society. The first amendment to the Constitution of the United States, for example, addresses the right to speak. The right to make reference to something is inherent in that right. On the web, to make reference without making a link is possible but ineffective – like speaking but with a paper bag over your head. It rather sounds as though the company in question is employing fairly open bullying tactics. Whilst it is easy for us all to say, “don’t do it, don’t bow to the pressure!”, the truth is that BlueHost will probably blink before you do, and you’ll be left with no site and possibly no short term business. In reality, the only entity gaining from the link (aside from you giving your visitors a good UX) is the linked site, and they want the link taking down: you’re not losing much and neither are they, but perhaps it does indicate that they (the big company) see your site as spammy (!!) and want to ditch the link. In any event they should just disavow it! just an odd off subject/kinda on subject thing. It should be noted that part of the client-server dialog when a link is clicked on a page is a data item called “HTTP_REFERER” [sic] which identifies the URL of a page on which a link was clicked. This is customary, but not obligatory. Any web server can easily accept or reject a page request based on the value of, or the existence or non-existence of HTTP_REFERER data, so there is a technical solution, which is much cheaper than hiring lawyers.